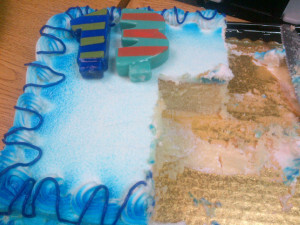 We had a great meeting and had the opportunity to celebrate our 13th birthday with cake and ice cream!! We reviewed Mac OS X applications Text Edit, Activity Monitor, Disk Utility and System Information. Our favorite web sites we reviewed were all summer related – All about weeds, Identifying Insects, Grilling help and outdoor DIY projects. We spent time reviewing password security and password managers. Here are a few of the options: 1Password, Last Pass and One Safe. TCMUG members enjoyed the cake today!!! We are having our monthly meeting this Saturday, May 16th from 2:00pm to 4:00pm at the East Central Ohio Educational Service Center. Since our group turned 13 years old in April we will be enjoying cake and ice cream at this meeting. Yeah!! We love food at our meetings. Our topics will include looking at OS X applications TextEdit and utilities like Activity Monitor, Disk Utility & System Information. We will also spend some time talking about security and passwords, iOS applications/tips, our favorite web sites and of course Q & A session. We look forward to seeing you at this upcoming meeting. Feel free to share this information with anyone that may find our meetings beneficial.